Explore a new perspective on reality and ponder questions you never knew you could ask. Since the publication of my book ‘Radical Inclusivity’many people have found it to be profoundly consciousness expanding. It is a short book, just over 100 pages, but it is filled with subtle and complex perspectives. That is why I decided to make an audio version in which I go through the book with you adding insight and commentary all along the way. This page is all about the audio book with commentary. If you want to delve deeper into the new reality of continuity-unfolding please join me. Radical Inclusivity is a way of understanding a new reality and the consciousness that goes along with it. It is also an approach to philosophical inquiry that opens up profound potentials and possibilities. 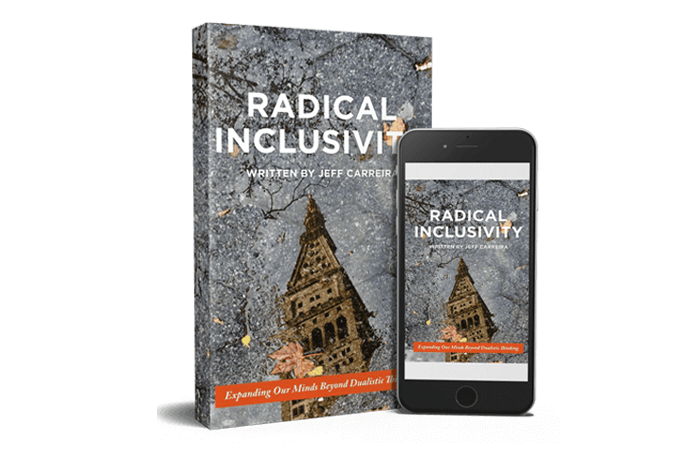 Immerse yourself in radical inclusivity with this audio book with commentary by Jeff Carreira. E-Book Version of ‘Radical Inclusivity’ – 160 pages of thought provoking inquiry. Six Audio Sessions (One per chapter,) each 1 hour long – These include the book being read, plus commentary from Jeff Carreira.